This article is about the species. For the armor, see HUNTER-class Mjolnir. "They're all scary and angry and they like to smash things." The Mgalekgolo (Ophis congregatio, meaning "serpent union"), is a gestalt of Lekgolo, which are small worm-like creatures that group together to exponentially increase their intelligence, strength, and maneuverability. Of the myriad Lekgolo collectives, the best known is the Mgalekgolo or Hunter, a bipedal form that is used for heavy assault. Ironically, the Mgalekgolo is among the least common Lekgolo configurations, but due to their formidable combat capabilities they are most commonly fielded by the Covenant. While the term "Mgalekgolo" is formally limited to this particular type of Lekgolo gestalt with the other forms having different names, it is sometimes applied to other Lekgolo colonies as well, such as that used to operate the Type-47B Scarab. "The Hunters have come to our aid, Arbiter. They will fight by our side." — A Special Operations Sangheili during the Battle of Installation 05. After the formation of the Covenant, early experiments with the Luminaries reverse-engineered from the Forerunner Dreadnought in High Charity led the Covenant to the Lekgolo homeworld Te, which was located near Urs, the home system of the Sangheili. While the San'Shyuum and Sangheili hoped to find a treasure trove of Forerunner artifacts, they instead found hives of Lekgolo inside orbital rings surrounding the planet. The rings were in fact the destroyed remains of an ancient Forerunner installation in orbit. The relics had been the Lekgolo's food for millennia, and the orbital rings were actually composed of digested-and-destroyed Forerunner relics that some of the Lekgolo had been consuming. An Arbiter facing off against unarmored Mgalekgolo. Enraged by the Lekgolo's "desecration" of Forerunner relics, the Covenant began a military campaign against the Lekgolo. After facing considerable difficulty eradicating the creatures, a Sangheili Arbiter was sent to study the Lekgolo for a full year on Rantu, one of Te's moons. It was there that the Arbiter witnessed the Lekgolo combine into Mgalekgolo to battle him, forming around a series of rocks to support their bipedal forms. Recognizing the potential of the gestalts, the Arbiter returned to High Charity and suggested that the Lekgolo be inducted into the Covenant. However, the Lekgolo initially resisted, leading to a conflict between them and the Covenant. While the Mgalekgolo won most of the time on the ground, they faced extinction and were forced into the Covenant by the superior starship technology of the Sangheili. This event later came to be known amongst the Covenant as the "Taming of the Lekgolo". The Covenant may have used Sharquoi armor designs for the Mgalekgolo armor. 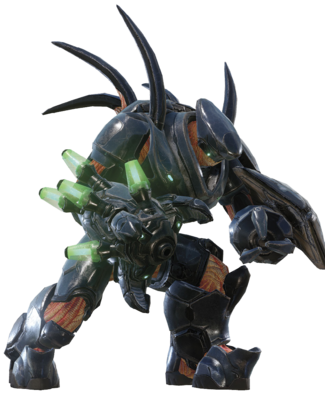 The Mgalekgolo gestalts, armed with thick armor plates and assault cannons, would come to serve the Covenant as shock troops. Numerous Mgalekgolo participated in the Human-Covenant War. During the Great Schism, most Mgalekgolo pairs sided with the Sangheili, though others remained with the Prophet of Truth and the main body of the Covenant. There is no known reason for the split in loyalty. During the further conflicts in the wake of the Human-Covenant War many Mgalekgolo would fight on behalf of Jul 'Mdama's new Covenant order against humanity and Swords of Sanghelios. These Mgalekgolo participated in the battles of Requiem, Nuusra, Sunaion, and Genesis. Others would remain loyal to Arbiter Thel 'Vadam and his Swords of Sanghelios. Several would join Vata 'Gajat's mercenary group and partake in the Battle of Ealen IV. Mgalekgolo part of the Banished were unusually aggressive and may have been forced into service. These Mgalekgolo would be deployed by the Banished against the crew of the UNSC Spirit of Fire during the Second Ark Conflict. Mgalekgolo almost never associate or communicate with other species other than the Sangheili. They are dismissive, scornful, and arrogant to the "lesser" species, and are contemptuous to their foes. Lekgolo worms on a Mgalekgolo's exposed back. A Mgalekgolo is not a single organism, but rather a collective of small, orange, eel-like creatures called Lekgolo. In order to form a Mgalekgolo, dozens of individual Lekgolo bond with one another both physically and neurologically to form a single "hive-minded" community. The Mgalekgolo is the most common form seen in combat during the Human-Covenant War, but is actually one of the rarer and smaller forms in the Lekgolo society, used primarily in interaction with the Covenant hierarchy. Their primary combat tactic is an approximation of a hunter-killer formation, hence the name "Hunter". Because of their combined neural nets' sensitivity to their surroundings, Mgalekgolo can think and work as an effective combat unit without even using verbal communication. They can also locate their enemies even without directly "seeing" them, such as when they are facing the opposite direction. Mgalekgolo do not use vocal chords to speak, but instead vibrate their bodies to make a low rumble to produce speech. They are capable of mimicking the language of other species, forming words and sentences that are "felt" rather than heard. Their quiet nature among other races of the Covenant is probably a result of difficulty speaking with other Covenant races. The known names of some Mgalekgolo seem to imply that they use very simple vowels and only a few consonants. Mgalekgolo usually stand between twelve to thirteen feet tall, but during combat they hunch themselves over to protect their vulnerable neck and midsection, reducing their height to roughly eight feet. They fight using assault cannons integrated directly into their armor, and they carry an enormous two-ton pavise shield made of an alloy derived from the same material that forms Covenant warship hulls. Mgalekgolo body armor is eight centimeters thick, with the shield being even thicker. Their shields and armor protect them from almost every form of plasma-based or ballistic weaponry available to Covenant and human infantry alike, and the shield a powerful melee tool capable of crushing anything in its path and allowing the Mgalekgolo to neutralize most enemies in close combat. However their heavy protection is inadequate against dedicated anti-tank weapons, with 102mm HEAT warheads, 105mm recoiless rifles, and 90mm high-velocity tank cannons taking them out with ease. The M149 Magellan 105mm recoiless rifle is even capable of over-penetrating both the pavise and the armor with a delayed fuze round. There are a few weak spots in the armor however, such as the lower back where they are vulnerable to regular weaponry. However, due to their sheer size and speed, it is difficult for enemies to hit these spots. The assault cannon the Mgalekgolo wields operates in two modes; one firing a single explosive capsule of incendiary fluid, the other spraying the fluid out like a beam. When a single Mgalekgolo becomes too big, the colony will divide in half to create two independent Lekgolo colonies. These colonies will share an extremely close and mysterious bond, referred to only as being "bond brothers", or "mates". Mgalekgolo that have split into "bond brothers" are recognized by spiked appendages that rise from their shoulders, which means that they are bonded to another Mgalekgolo. Bonded Mgalekgolo colonies are dropped into battle together by the Covenant, as the Spartans learned: where you find a Mgalekgolo, there is always another close by. If one of the bonded colonies is killed, the other will go into a frenzied state, much like the berserk state of a Jiralhanae, or the suicidal charge of a desperate Unggoy. If left alone for a long period of time, however, they will adopt a "tactical split personality" of shooting followed by melee attacks. On one occasion a Mgalekgolo that's bond brother was killed went berserk killing its allies aboard the crashed Radiant Perception and eventually became suicidal. Banished Goliaths during the Battle of Installation 00. "It is a walking tank that bulldozes foes with its powerful melee smash attacks, crushing anything that gets in its way." — Jeff Easterling on Goliaths. Unlike a typical Mgalekgolo pair, which splits a colony into two independent bodies, Goliaths are a Hunter-style body containing a single Lekgolo colony that optimizes brute strength over all other considerations, forgoing the typical assault cannon. Unlike normal Hunters Goliaths are quadrupedal. Inside the Goliath’s armored shell most of the Lekgolo in the gestalt adapt to function as corded pseudo-muscle and thick-skinned protective bands, with a minimum of sensory and cognitive function. Goliaths are not easily self-sustained due to their ravenous hunger for nutrients, and are typically only seen in times of extreme danger among feral Lekgolo, but "Colony" of the Banished can coerce or direct subsidiary gestalts into this form seemingly at will. "Colony" deployed Goliaths against the crew of the Spirit of Fire during the Battle of Installation 00 in 2559. Goliaths were also employed by Pavium during the Flood outbreak on the Installation, in which they were employed to break through rubble and clear a path for the Banished forces' retreat. Mgalekgolo have three names: a personal name, a bond name, and a line name. When written with the Roman or Latin alphabet, the three names can be transposed together as one single name or separated by spaces. The personal name is given at their "birth". The bond name, or their middle name, is taken between bonded pairs. Examples of some Mgalekgolo names include Igido Nosa Hurru and Ogada Nosa Fasu. The line name represents the genetic heritage, being the name of the most successful Mgalekgolo of its ancestors. If one reaches a certain level of status, its offspring will have its personal name as their line name. Edward Buck fighting a golden Hunter on Tayari Plaza. Unlike most Covenant forces, Mgalekgolo seem to possess no visible rank. As they are deployed more like equipment or weapons platforms rather than conventional troops, rank may simply not apply for them. However, they can be deployed independently of other Covenant troops, which may indicate that a level of independence and responsibility may be granted, thus meaning that they may have a high enough rank to be trusted by themselves. During the Battle of Sigma Octanus IV, Mgalekgolo are seen guarding the crystal in Côte d'Azur, which is retrieved by Blue Team. One of these Mgalekgolo killed a Kig-Yar by stepping on it, demonstrating the Lekgolo colonies' characteristic disregard for the lives of other species, whom they generally view as annoyances rather than allies. During the Onyx Conflict, some Mgalekgolo apparently had command of lower-ranking Sangheili, even killing one of them for failing to follow orders, signifying they may have a higher military rank in the Covenant military than previously indicated. During the Battle of Mombasa, Mgalekgolo appeared in two different forms in two different colors: the normal blue-armored Mgalekgolo that are armed with an assault cannon that fires a continuous stream of radioactive incendiary gel, and a gold-armored Mgalekgolo armed with an assault cannon that fires a single bolt of radioactive incendiary gel. By 2559 the Banished utilized Mgalekgolo Captains under the command of "Colony". These Captains are linked directly to "Colony" and Banished Lekgolo colonies operate at full efficiency while Captains are on the field. French Les Hunters in Halo: Combat Evolved. Les Chasseurs in all media since Halo 2. Spanish Los Cazadores in Halo: Combat Evolved. Los Hunters in all media since Halo 2. Halo: The Flood, mentions that Mgalekgolo have skin and a jutting spine. This is incorrect, as they were later revealed to be a compound of small worm-like creatures. However, this does not preclude the possibility that the worms may form a skin-like membrane on the outside of their colony for protection against more casual damage, and in Halo 3 a metal column can be seen after the back armor plating has been detached, perhaps forming an artificial "spine" for vertical support. Strangely, the reference to Mgalekgolo having spines was kept in the 2010 re-release of the novel. At first, Mgalekgolo were meant to comprise the whole of Heretic forces on the Threshold gas mine. The Mgalekgolo was inspired by the Pfhor Hunter from the Marathon series, as well as by the Drinniol, or Hulk, from the original Marathon. However, the Pfhor Hunter is actually a class of power armored soldier with a shoulder-mounted cannon rather than an arm-mounted cannon. The Drinniol also inspired the creation of the Drinol, Covenant species that was designed for Halo: Combat Evolved but was cut during development. No Mgalekgolo are ever seen supporting the Master Chief during the events of Halo 3. This is because in the making of Halo 3, Bungie did not want to confuse players by having them with both allies and enemies. Despite appearing on the cover of Halo: Spartan Assault none actually appear in game. In the Halo Legends episode The Duel, the Mgalekgolo are shown to be at least 50 feet tall. This was explained by Frank O'Connor saying that a Hunter's appearance changes due to the gravity and environment. When combating Mgalekgolo, a player can 'leapfrog' the charging melee attack, either jumping above or to the side of the Mgalekgolo. This exposes the rear armor to a quick shotgun blast or grenade stick, often resulting in death on lower difficulties. Although this tactic does not work as well on Halo 3: ODST, simply circling around behind the Mglekgolo at the right time works the same way. In Halo 3, it is possible to splatter a Mgalekgolo with an M274 Mongoose. In Halo: Combat Evolved Mgalekgolo are not harmed by fuel rod guns. This may be because you're not supposed to have fuel rod guns in campaign, or it may be a precaution meant to prevent Mgalekgolo from injuring each other when fighting. Mgalekgolo have ranks in the actor variant tags. One variant is called 'Hunter' and another called 'Hunter major'. In Halo: Combat Evolved, a single shot from a pistol or sniper rifle to any non armored section will kill a Mgalekgolo; this is likely because the Mgalekgolo's exposed flesh was considered to be its "head." In Halo 2, a Mgalekgolo's mass is enough to kill other characters if they push them against a surface. This can sometimes be seen in The Great Journey, where friendly Mgalekgolo may accidentally crush Sangheili against walls. In Halo 2, it is impossible to kill or even damage Mgalekgolo with melee attacks. In Halo Wars, a Mgalekgolo's shield can deflect projectiles that would almost always kill them in previous games, like Wraith Mortars and shots from the M808B Scorpion's main cannon. In Halo: Reach, Mgalekgolo have received a huge graphical overhaul. They are much more textured, are larger, have Forerunner symbols and emblems on their armor and appear to have some kind of eyes on their helmets. Mgalekgolo are also much tougher in Reach. They are capable of surviving multiple explosive hits and even repeated plasma grenade sticks. Their back armor is much more durable, making their weak point harder to expose. They will also raise their shield vertically when being attacked from the front, covering both their neck and mid-section to protect themselves from incoming fire and are less likely to turn around and expose their back to the player. In Halo: Reach, a near-miss from a Mgalekgolo's melee will cause the player's screen to violently shake. Although the Mgalekgolo present in Halo: Anniversary use the Halo: Reach skin, they are almost half the size of their Halo: Reach counterparts due to the much smaller skeleton frame used in the original game. Their abdomens also appear to be armored, though this armor doesn't do anything and they're just as vulnerable as they were in the original game. In Halo 4, Mgalekgolo perform melee attacks much faster than their predecessors, making it harder to dodge them. Like in Halo Reach, a near-miss from a melee will cause the player's screen to violently shake. In Halo 2: Anniversary, Mgalekgolo received a new skin that also incorporates abdominal armor, though this armor is also purely cosmetic and offers no protection whatsoever. In Halo 5: Guardians, Mgalekgolo are far more lethal than their predecessors. Their melee strikes are now nearly impossible to dodge. They also utilize both firing modes of their assault cannons. They also appear to be far more durable than their predecessors. In addition, when one is killed, the remaining Mgalekgolo will go into a "rage", start emitting green electrical sparks, move faster and more aggressively, and will fire its assault cannon's close range attack twice in each volley. In Halo: Combat Evolved and Halo 3: ODST, players can avoid Hunters at certain points during Assault on the Control Room and Mombasa Streets, where some Hunters are "asleep" despite ostensibly being in their combat stance. The Hunters will not notice if the player is nearby unless the player attacks them or makes noises near them, similar to the way sleeping Grunts can be awakened by noises. In the Halo: Combat Evolved level Assault on the Control Room on the lower level of the control room, the player can score a double-kill with one shot from a sniper rifle if they manage to catch a pair of "asleep" Hunters off-guard. In Halo: Combat Evolved, splatter kills against Hunters are extremely easy due to the game mechanics allowing a small prod to instantly kill them. They often choose to avoid vehicles rather than engaging them head-on. In Halo: Combat Evolved, when engaging Pod infectors at close range, Hunters will often try to shoot rather than melee them, killing themselves in the process. This could be due to their size making it difficult for them to aim properly. In Halo: Combat Evolved, Hunters are far more vulnerable than they are in later games. On lower difficulties at least, they can be killed through a single shot to the weak point in the back of their armor. They are so vulnerable that even a single pistol shot to their weak point can kill them. In later games, the best strategy for dealing with Hunters when there is no access to a weapon such as a rocket launcher is to stick them with a plasma grenade. The explosion will blow the back of their armor above the weak spot off, giving the player a wider area to target with their weapons. However, they still remain difficult to kill due to the need to dodge their attacks while aiming for the weak spot. In the Halo: Reach level New Alexandria, the player runs into a situation where they fight four Hunters at once instead of just two. There is a rocket launcher available in the room this occurs in which is sufficient with proper targeting. In Halo 3: ODST, Hunters are fairly easy to deal with compared to the later games in the Halo series, likely reflecting the fact that the player is no longer controlling a Spartan and is instead controlling weaker ODSTs. On lower difficulties at least, a good strategy is to blow off the back of a Hunter's armor with a plasma grenade and then rake their exposed back with fire. In that game, it doesn't take much fire to kill one once their back is fully exposed, especially compared to Halo: Reach when in a similar situation, Hunters are extremely hard to kill. A good weapon to use against Hunters when a rocket launcher or fuel rod gun is not available is a shotgun, particularly after a Hunter's armor has been blown off in the back. Ideal for close-range combat, shotgun blasts inflict more damage than weapons such as an assault rifle. In order to get a Hunter to expose their weakness, a player typically needs to get close enough to make the Hunter charge, generally ending with them in close proximity even when the Hunter is vulnerable. At this kind of proximity, a shotgun is ideal for its stopping power and close-combat effectiveness. In the Halo: Reach levels ONI: Sword Base and The Pillar of Autumn, shotguns can be found in close proximity to where the player encounters and fights Hunters. Like most other races of the Covenant, Mgalekgolo's blood differs from that of humans. Mgalekgolo blood is bright, fluorescent orange and appears to have a very thick, slimy texture. It has also been noted that their blood smells strongly of burnt plastic, hinting that the make-up of their bodily fluids is drastically different from that of a human. Early concept art of a Hunter for Halo: Combat Evolved. Concept art of a Hunter for Halo: Combat Evolved. A conceptual render of a Mgalekgolo in Halo: Combat Evolved. Final in-game view of the Mgalekgolo in Halo: Combat Evolved, with gun raised. Alternate preview of the Mgalekgolo in Halo: Combat Evolved, crouched behind its massive shield. A Mgalekgolo in Halo: Combat Evolved. Finalized concept art of a Mgalekgolo for Halo 2. 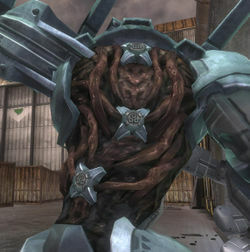 An in-game view of the Mgalekgolo in combat stance in Halo 2. An in-game view of the Mgalekgolo running in Halo 2. A Mgalekgolo preparing to launch a melee attack in Halo 2. An in-game view of the blue-armored Mgalekgolo in Halo 3. A Mgalekgolo about to fire its assault cannon. A Mgalekgolo firing its assault cannon. A Mgalekgolo pair in combat in Halo 3. Early sketch of a Mgalekgolo for Halo Wars. Concept art of a Mgalekgolo for Halo Wars. 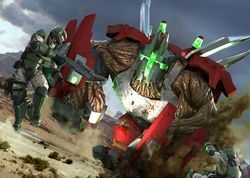 A pair of Mgalekgolo from Halo Wars. An in-game view of the gold-armored Mgalekgolo in Halo 3: ODST. A pair of gold Mgalekgolo in Halo 3: ODST. Mgalekgolo blood in Halo 3: ODST. Note the blood's luminosity. A larger form of Mgalekgolo in the Halo Legends episode, The Duel. A Mgalekgolo carrying three Unggoy Minors during the Battle of Line Installation 1-4 in Halo: Blood Line. A Mgalekgolo in the Halo: Reach Beta. An in-game view of the Mgalekgolo in Halo: Reach final build. A group of Mgalekgolo ready to attack in Halo: Reach. A Mgalekgolo about to launch a melee attack in Halo: Reach. Mgalekgolo in Halo: Combat Evolved Anniversary. In-game preview of the Mgalekgolo in Halo: Combat Evolved Anniversary. A Mgalekgolo in Halo 4: Forward Unto Dawn. A close-up of a Mgalekgolo's helmet in Halo 4: Forward Unto Dawn. Conceptual three-dimensional render of a Mgalekgolo in Halo 4. John-117 battling a Mgalekgolo in during the Raid on Ivanoff Station. Sarah Palmer fighting a Mgalekgolo in a War Games simulation in Halo: Escalation. 3D render of the Mgalekgolo's body armor in Halo 2: Anniversary. Final render of the Mgalekgolo in Halo 2: Anniversary. A render of the Mgalekgolo in Halo 2: Anniversary. Render of the Mgalekgolo in Halo 2: Anniversary. Mgalekgolo at the Bastion of the Brutes. A close-up of a Mgalekgolo's helmet in Halo 2: Anniversary. Pre-Covenant Mgalekgolo in Halo 2: Anniversary's terminals. A Mgalekgolo being formed aboard the Argent Moon in Halo 5: Guardians. First pair of Hunters engaged by Fireteam Osiris on the landing zone at Sanghelios. A Mgalekgolo and a Swords of Sanghelios Sangheili Storm dueling. Hunter going berserk on Sunaion as their bond has been broken. A Hunter trapped by 031 Exuberant Witness on Genesis. Two Legendary Mgalekgolo part of a War Games simulation. A Serpent Mgalekgolo on Escape from ARC. A hologram of an Elder Mgalekgolo. An Elder Mgalekgolo on Raid on Apex 7. Another Elder Mgalekgolo on Raid on Apex 7. Render of a Remnant Mgalekgolo in Halo 5: Guardians. Render of a Serpent Mgalekgolo in Halo 5: Guardians. A Mythic Mgalekgolo in Halo 5: Guardians. Concept art of a Banished Mgalekgolo for Halo Wars 2. Concept art of a Goliath for Halo Wars 2. More concept art of the Goliath. Concept of a Goliath fighting a M808S Scorpion. Banished Mgalekgolo in the Halo Wars 2 Open Beta. Render of the Halo Wars 2 Hunter unit. Blitz card of a Banished Mgalekgolo in Halo Wars 2. Blitz card of an Ironclad Mgalekgolo fighting UNSC Marines. Blitz card of a Scarred Hunter. Blitz card of a Banished Mgalekgolo Captain fighting UNSC Marines. "Colony" the Banished leader of the Lekgolo. Hunters fighting Marines on Installation 00. Two Goliaths on Installation 00. A Hunter Captain, Goliath, and Hunter bond brother pair in Halo Wars 2. The Hunter figure from the sixth Halo Legendary Crate. ↑ Halo: The Flood, "Chapter ?? ", page ??" ↑ Halo: Smoke and Shadow, page ??? ↑ Halo 3 Essentials: Disk ? ?